Associate Professor at the University of Western Ontario and a family physician practising in Mount Brydges, Ont, and Strathroy, Ont. Assistant Professor at the University of Western Ontario and a family physician practising in London, Ont, and Exeter, Ont. Distinguished Professor in the Faculty of Law at the University of Western Ontario in London. Objective To review the medical, ethical, and legal obligations in caring for adults with developmental disabilities (DDs) living in the community. Sources of information Google and MEDLINE searches were conducted using the terms disabled, disability, vulnerable, and community. The pertinent legislation was reviewed. Main message The treatment of a patient with DDs varies with factors such as the pathogenesis of the patient’s current problem, comorbid conditions, the severity of his or her disabilities, and his or her current social supports. While the shift from institutional to community care for patients with DDs is widely accepted as being beneficial, providing high-quality community care has proven to be challenging. However, there is little research on how to effectively provide community support to adults with DDs. As primary care providers, family physicians are often the first point of contact for patients, and are responsible for both the coordination and the continuity of care. With the movement toward preventive care and early disease detection, the patient’s active participation is also vital. The patient’s values and goals are an essential consideration, even when they are contrary to the patient’s good health or the clinician’s own values. The legislation for vulnerable persons varies among the provinces. Thus, the obligation to report suspected abuse might depend on whether the vulnerable person is living in a care facility or the community; whether the person with the suspicion is a service provider or health care professional; and whether the specific circumstances fall within the legislative definition of abuse or neglect. Conclusion Primary care providers must give adults with DDs compassionate care that respects the patients’ wishes. For most of the past century, adults with developmental disabilities (DDs) were cared for in large institutions. It was believed that institutionalization provided better care, protection from harsh living conditions, and the opportunity to acquire life skills that might facilitate eventual reintegration into society.1 In reality, placements were likely to be permanent, with poor living standards and social isolation. Within these institutions, the residents were afforded very few rights and, as a result, various forms of abuse and maltreatment took place, with little recourse.1 As the public became more informed about the realities of institutionalized life, the philosophy of care gradually shifted toward a system of home-based supports for people with DDs so they could live and participate in the community. In the 21st century, the concept that DDs can be cured medically in large “asylums” seems absurd and antiquated. Yet surprisingly, the last large institution in Ontario was only closed in 2009.1 This paradigm shift has resulted in more adults with DDs being looked after by primary care providers, many of whom might lack the experience and training necessary to understand the complex needs of these patients. The following discussion highlights some of the medical, ethical, and legal considerations in providing primary care to adults with DDs living with family members in the community. A middle-aged man with cerebral palsy and his elderly mother were brought to a community emergency department for medical assessment. The son, who requires total nursing care and is nonverbal, had texted “HELP” from his computer to a family friend. An ambulance was dispatched, but the paramedics were unable to get into the house. With police assistance, they gained entry and found the mother sleeping on the floor, while the son was in his own bed. Neither was in acute distress. However, the house was in disarray and full of clutter, prompting the fire marshal to declare it uninhabitable. In the emergency department, both patients were diagnosed with upper respiratory infections. While admission for acute medical treatment was not warranted, they were admitted because they were unable to return home. Google and MEDLINE searches were conducted using the terms disabled, disability, vulnerable, and community. The pertinent legislation and literature were reviewed. There is little in the research to guide a practitioner on how to effectively provide community support to adults with disabilities. The research found was primarily descriptive. In this case, understanding the severity of the son’s cerebral palsy was an important contextual factor in arriving at an appropriate plan. Further physical examination did not reveal any evidence of neglect. For example, his skin was intact and he appeared to be well nourished. Nevertheless, his living situation and apparent lack of social supports raised substantial concerns for his continued well-being. Entwined in this discussion is the ethical obligation of clinicians to act as health advocates. As primary care providers, family physicians are often the first point of contact for patients, and are responsible for both the coordination and the continuity of care.2 With the movement toward preventive care and early disease detection, the patient’s active participation is also vital. The patient’s values and goals are an essential consideration, even when they are contrary to the patient’s good health or the clinician’s own values.7 In most instances, clinicians are comfortable with providing evidence-based care within the patient’s social and personal beliefs. The situation becomes more challenging when physicians must treat an adult who is unable to make his or her own decisions and whose treatment requires the consent of a substitute decision maker (legal guardian). In this case, the son was under the care of his aging mother. While he was not in imminent danger, his living situation had the potential to endanger his health. Initially, the mother did not believe that she or her son needed any assistance, and she would have been happy to carry on in the same manner. In fact, it had been more than a year since the son had visited his own family doctor. In exploring the community resources, it became clear the mother had a history of declining outside help. Home care had previously been involved, but the mother had discharged them. There were also 2 daughters, but both were estranged and the mother declined to allow contact with them. In this case, it was difficult to effectively advocate for someone who could benefit from outside help but who had consistently declined it. Clinicians must respect the autonomy of their patients. The mother was capable of making decisions on her son’s behalf, and there was no evidence that she was unstable or suffered from dementia. Although the son might not have been capable of making treatment and personal care decisions, it was important to respect his wishes if they could be ascertained. It was evident from observing the mother and son interact that there was a great deal of love between them and that separating them would cause him great distress. In addition to respecting autonomy, clinicians must balance their actions in terms of beneficence and nonmaleficence. This obligation requires clinicians to be “clear about risk and probability when [they] make [their] assessments of harm and benefit.”8 Had the professionals in this case overreacted to the son’s social situation, it would not likely have resulted in physical harm to him. Nevertheless, it could have caused great mental anxiety, anguish, or harm to both mother and son. The 2 had been together since the son’s birth and the mother had continuously provided him with total care. The son’s previous admission to respite care when his mother required surgery had not gone well for either of them. Finally, concerns were raised about whether the primary care team had a legal obligation to report the son’s situation in terms of suspected abuse or neglect. The vulnerable persons legislation varies among the provinces and is typically quite technical. Thus, the obligation to report might depend on whether the vulnerable person is living in a care facility or the community; whether the person with the suspicion is a service provider or health care professional; and whether the specific circumstances fall within the legislative definition of abuse or neglect. In some provinces, such as Newfoundland and Labrador, it is mandatory for any person to report suspected abuse of a neglected adult, while in other provinces, the duty to report is limited to service providers. In some provinces, the legislation permits but does not require the suspicion to be reported. In Ontario, the law imposes a broad duty to report on anyone who suspects that a resident of a long-term care or retirement home has been or might be abused.9 While agencies providing services to a person with DDs must report any suspected, alleged, or witnessed abuse of that person even if he or she resides in the community, no such obligation is imposed on health care providers.10 Thus, as the son was living with his mother in the community, the primary care team had no legal obligation to report their concerns about neglect. Given the highly technical nature and complexities of the provincial and territorial legislation, it might be best to contact your governing medical college for advice about your mandatory reporting obligations. In this case, the health care professionals were primarily concerned with the treatment and care decisions that the mother was making on behalf of her son. Under the Ontario Health Care Consent Act,11 the professionals could have applied to the Consent and Capacity Board to challenge the mother’s decision as not being in the “best interests” of her son. If the board concluded that the mother’s decisions were inconsistent with the act, it could substitute its opinion for that of the mother. Similarly, the health care professionals could have notified the Office of the Public Guardian and Trustee (OPGT) of their concerns. If the OPGT believed that the son was incapable and was suffering or at risk of suffering serious illness or injury, it could apply to the court to become the son’s guardian. Most provinces have established similar hierarchies of substitute decision makers and methods of removing them in appropriate circumstances. However, resorting to these formal legal processes would have put the primary care team in an adversarial relationship with the mother and her son. In turn, this might have resulted in the severing of the ongoing relationship with the mother, thereby precluding any further opportunities to assist her with better caring for her son. An algorithm for an action plan when confronted with these difficult situations is presented in Figure 1. It was believed that the situation was not dire enough to warrant the intervention of the Consent and Capacity Board or the OPGT. In the end, the mother acknowledged the dangers inherent in her clutter and worked to remedy them. The fire marshal approved the improved living conditions and the mother and son were allowed to return home. Home care was consulted, but the mother again declined its assistance. The family physician had a good relationship with the mother and agreed to make periodic home visits to monitor the situation. He also had a discussion with the mother about the need to provide preventive care to her middle-aged son. The fire marshal indicated that regular visits would be made to ensure that the house was safe. While this situation has resolved itself at present, there will be future challenges as the mother ages and eventually becomes unable to care for her son. Discussions with the mother did result in vague agreements to explore future options. However, the reality is that these agreements have not been acted on in the past and will probably not be acted on in the future until another crisis occurs. Nevertheless, it is the belief of the health care providers that the best of an imperfect situation has been made, and they can accept that. Primary care providers must give adults with DDs compassionate care that respects the patients’ wishes. Care must be taken when distinguishing between impairments attributable to patients’ underlying developmental disabilities and those resulting from superimposed acute medical diseases. In addition to respecting autonomy, clinicians must balance their actions in terms of beneficence and nonmaleficence. 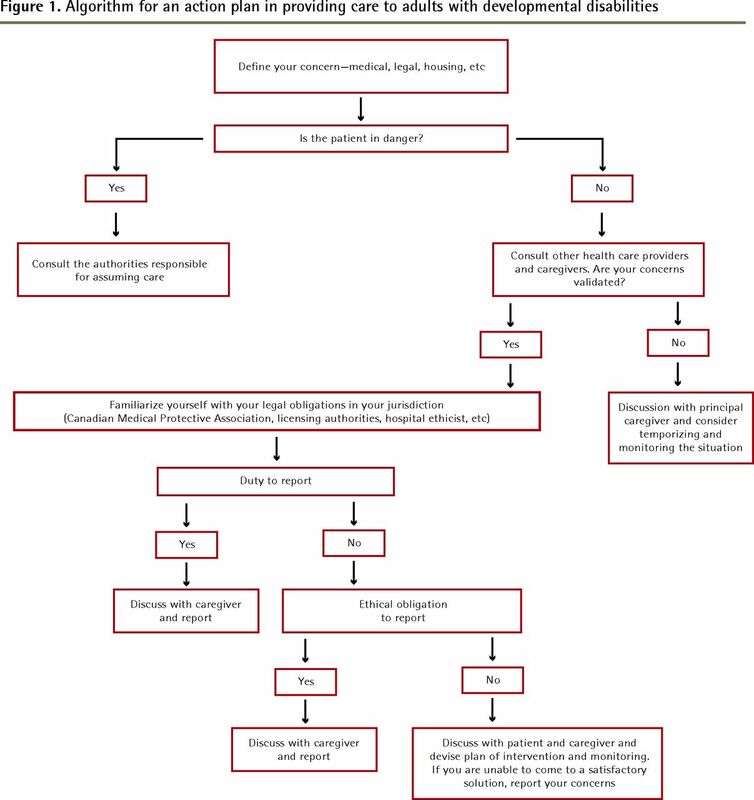 Primary care teams should determine whether they are obligated to report suspected abuse to the authorities. The vulnerable persons legislation varies among the provinces and is typically quite technical. La traduction en français de cet article se trouve à www.cfp.ca dans la table des matières du numéro de janvier 2015 à la page e4.
. Enforcing the rights of people with disabilities in Ontario’s developmental services system. Toronto, ON: Law Commission of Ontario; 2010. Available from: www.lco-cdo.org/disabilities/joffe.pdf. Accessed 2013 Jan 11.
. Primary care of adults with developmental disabilities: Canadian consensus guidelines. Can Fam Physician 2011;57:541-53. (Eng), e154–68 (Fr).
. Community care for severely disabled people on low incomes. BMJ 1995;311(7013):1121-3.
. A system of integrated care for older persons with disabilities in Canada: results from a randomized controlled trial. J Gerontol A Biol Sci Med Sci 2006;61(4):367-73.
. Rethinking quality in the context of persons with disability. Int J Qual Health Care 2003;15(4):287-99.
. Primary care ethics. In: Singer PA, Viens AM, editors. The Cambridge textbook of bioethics. Cambridge, UK: Cambridge University Press; 2008. p. 475-80.
. Medical ethics: four principles plus attention to scope. BMJ 1994;309(6948):184-8. Government of Ontario. Long-Term Care Homes Act, 2007. S.O. 2007, chapter 8. Toronto, ON: Service Ontario; 2014. Available from: www.e-laws.gov.on.ca/html/statutes/english/elaws_statutes_07l08_e.htm. Accessed 2014 Dec 8. College of Physicians and Surgeons of Ontario. Policy statement #6-12. Mandatory and permissive reporting. Toronto, ON: College of Physicians and Surgeons of Ontario; 2012. Government of Ontario. Health Care Consent Act, 1996. S. O. 1996, chapter 2, schedule A. Toronto, ON: Service Ontario; 2010. Available from: www.e-laws.gov.on.ca/html/statutes/english/elaws_statutes_96h02_e.htm. Accessed 2014 Nov 20.